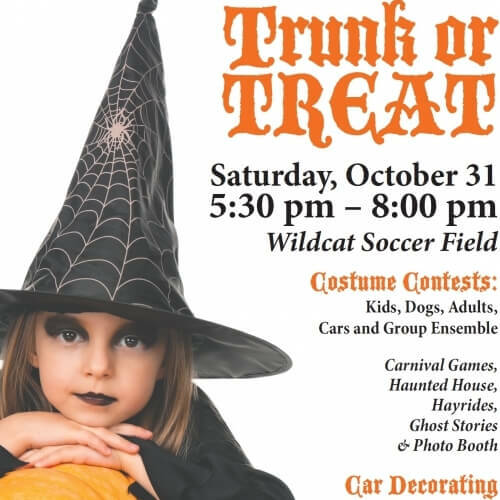 The Big Canoe POA and Canoe Cubs are proud to present the annual Big Canoe Trunk or Treat on Saturday, October 31 at the Wildcat Soccer Field. The hocus pocus will begin at 5:30 pm and the spell will last until darkness, 8:00 pm. Trunk or Treat is not just about the original and cute attire. For youngsters, carnival games will provide some silly smiles and laughs. For the older trolls, the Haunted House will provide boos and spooks for those brave enough to enter and a crafted storyteller will speak of haunted tales. Yet, all ages will be able to enjoy a long, tractor pulled hayride through Wildcat Neighborhood. Don’t forget to stop by the Trunk or Treat Photo Booth to capture the perfect moment. What would Trunk or Treat be without the Trunks? Car decorating is a crowd favorite and this year, goblins will have plenty of time to setup their spirited sets.